Mark Strother graduated from Bloomington North High School ranked among the top students in the class of 2004. He received a prestigious Lilly Endowment Community Scholarship and chose to attend Indiana University, where he continued to flourish in the classroom. Strother enrolled in IU’s highly-competitive Liberal Arts and Management Program (LAMP). LAMP enables College of Arts and Science students to combine their liberal arts studies with challenging management coursework through the acclaimed Kelley School of Business. A film major, Strother hoped that the LAMP program could serve as a catalyst for eventual opportunities in the business side of the film industry. However, he acquired a much greater lesson during the fall semester of his sophomore year. Unfortunately for Strother, this “revelation” can sometimes be a double-edged sword. Strother has certainly heeded this advice. After starting as a film major, he switched to an environmental management program in the School of Public and Environmental Affairs before transferring back to theCollege of Arts and Sciences as anthropology major. According to Strother, the desire to broaden your horizon should not be limited to the classroom. Strother will have just that opportunity when he joins 10 other students for archaeology field school in Belize during IU’s first summer school session this May and June. For seven weeks, Strother and his classmates will learn basic excavation techniques, site analysis and GPS mapping on an ancient Mayan site. Although anthropology is probably not in his immediate career plans, Strother knows that experiences like the Belize trip will pay dividends towards whatever field he ultimately chooses. St. John, daughter of David and Karin St. John, was the captain of the soccer and track-and-field teams at BHSN. She was the co-president of the BHSN chapter of Habitat for Humanity and served on the family selection committee for the Monroe County chapter of the organization. She was also the president of the school’s Hoosiers Outrun Cancer team and a member of both the National Honor Society and the National Arts Honor Society. Alex is a photographer, jewelry designer, interior decorative painter, and a volunteer for a number of organizations including the Hoosier Hills Food Bank, Monroe County Humane Association, and Bloomington Community Kitchen. Evelyn is the daughter of Mark Edward and Mary Clare Bauman was a member of the Sounds of South Advanced Choir, the choir of the St. Paul’s Catholic Center, Theatre South, the BHSS Student Council, and the BHSS volleyball, dance, and tennis teams. She has volunteered as a tutor at Middle Way House, as an assistant for the 8th grade volleyball team at St. Charles Catholic School, and as the vice president for the Bloomington South Riley Hospital for Children Dance Marathon, among many other service activities. Her academic honors included the AP Scholar Award, National Honor Society, and National Merit Recognition. 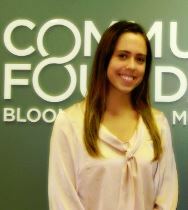 Bauman is the second person in her family to become a Lilly Scholar – her sister, Lynne, received the award last year. Join our mailing list to receive our newsletter and keep up to date with the CFBMC's community events, scholarship deadlines, and more!